So what do you look for in a shortwave radio? So, you are ready to go off the grid, camping out in the countryside – no internet, mobile network, and electricity, you are excited but also scared. You trust yourself to maintain your sanity without checking your phone for a few days, but can we all agree that being off the grid without any news is implausible? Having one working system to connect you to the rest of the world makes sense, right? 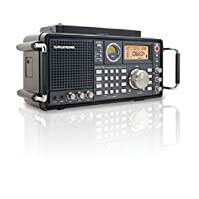 Well, you have to have a shortwave radio and being away from civilization, investing in poor quality or the cheapest available shortwave radio is out of the question. But, there’s one huge problem: finding the best shortwave radio on a market which presents new models of shortwave radios all the time. If you are caught in the mayhem of shortwave radio models that differ or bear seemingly similar functions, features, or the ones that can transmit at specific transmission ranges, we’ve got you. This article is a shortwave radio review of the 5 best radios, as well as a guide to the best radio. 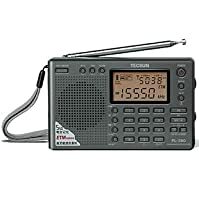 Make your next trip out of town memorable with this Tecsun PL880, a shortwave radio that offers full-range coverage comprising of Longwave and Shortwave, AM/FM, and a single sideband (SSB). It offers unparalleled bandwidth selectivity and radio reception sensitivity with its PLL synthesized digital dual conversion receiver. It is 4 and 5 selectable bandwidth filters available respectively on AM and SSB, as well as the SSB receiver with the 10Hz tuning step promises the best transmission and reception away from civilization. You might also like its single 18650 Li-ion rechargeable battery that comes with an inbuilt charger. These keep you connected throughout. Yes, it comes with the battery. And, you won’t have to guess what time it is thanks to the 24-hour alarm clock and the sleep-timer that lasts between 0-120 minutes. It boasts an external shortwave antenna that increases reception, a carrying pouch to secure it in the rugged environments (it only weighs 1.15lbs), stereo earphones to keep you entertained at night, and user manual to guide first-time users. If you are looking for a small size radio that receives FM stereo, longwave, AM, and shortwave, one that is easy to operate and is multifunctional, you might want to try this Tecsun Radion PL-380. Its wide FM receiver frequency ranges from 64-08Hz. It contains part of the campus radio, and it also has 2-5 channel TV sound programs. Among its other excellent features is the 7-method selection set including the Easy Tuning (ETM), Manual search for saved stations (VM), a manual search for radio frequency (VF), and the direct input frequency or the number of radio addresses into the pre-existing numbers directly. You might also like that this radio may be manual, fully automatic, or semi-automatic. And, it stores upwards of 550 radio frequencies in FM, LM, or MW. There’s also the multi-function display for radio frequency, temperature, signal strength/ noise ratio, and battery power among others. Energy saving thanks to its 3 R6 (V) batteries. Clear and strong FM signal. This is a robust radio with AM, FM, Shortwave and Aircraft bands. It’s set with 9/10 KHz AM tuning, and you can set a wide FM tuning range. It also features an SSB and the 360-degree rotating AM antenna. 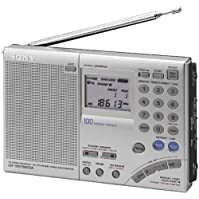 You might also like its 1000 station memories, its dual alarm function, the line-in socket that allows for the use of the radio as an MP3 speaker, and its auto tuning storage function for AM/ FM/ and shortwave. Its external antenna can support AM and FM. There’s also the DSP technology which enhances the sensitivity of tuning while fielding out interference. The volume knob is not located well. Your search for the best shortwave radio for use in the mountains or at sea easily ends with this high-performance, durable, and reliable Kaito radio. 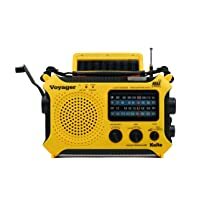 It is a 6-way powered portable radio for emergencies. It features a hand crank generator, a solar panel, as well as a compartment for 3AA batteries. This Kaito radio also has a 5V USB input, a 5V AC/DC input though sold separately, and a built-in NiMH rechargeable and replaceable battery pack. These features ensure that you are connected regardless of your location. Its comprehensive coverage and preprogrammed NOAA weather channels will keep you entertained in contact with the rest of the world throughout. Kaito KA500 radio also connects to the real-time weather forecast and also with PEAS – the Public Emergency Alert System. The best part is that it works as an emergency battery for smartphones, digital cameras, and GPS units, among others. Also included are a 5-LED reading lamp, a LED flashlight, and a red SOS beacon light. Its telescopic antenna extends as high as 14.5” increasing its sensitivity. The antenna boasts an advanced semiconductor circuitry-design and an LED signal strength indicator that pinpoints tuning accuracy. Can be powered with electricity, using batteries, or using the solar panel. SW reception has a few issues. This Sony ICF-SW7600GR features a PLL digital tuner that receives AM/MW, FM, shortwave and longwave bands. It has a MY-Memory tuning feature that will memorize and scan up to 100 frequencies. It’s simple to use thanks to its four tuning methods: direct, scan, manual, and preset, as well as its label preset that has 6 alphanumeric letters. Its world clock, the dual clock functions, and the built-in timer will keep you on time. As mentioned above, finding the best shortwave radio amidst hundreds of models is confusing and frustrating. We promise to simplify your search with an outline of the features and elements that make the best radios. But first, why can’t you rely on the high-frequency broadcasts? They do not travel beyond 40 miles, and they travel in rather straight lines. If you are traveling for a short distance, then the high-frequency broadcast on your car will work, and you may access all your favorite radio stations. However, if you are traveling for longer distances, you can only receive radio communications with a shortwave radio which will receive transmissions even at low frequencies which can pass through and across vast distances. 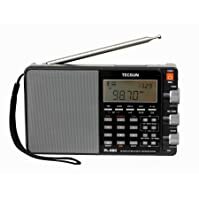 Shortwave radio is an essential part of your emergency preparedness kit and is common with the military, survivalists, and outdoor enthusiasts or researchers. A radio’s sensitivity provides strong signals even in suboptimal conditions. However, the receiver’s sensitivity depends on various technical elements like the signal to noise ratio of your electronics or the noise performance. A sensitive radio can broadcast weak signals because it has a greater level of radio wave discrimination. Regarding the bandwidth selectivity, know that some receivers let you choose between the wide and narrow selectivity bandwidths. With a narrow bandwidth, you can reduce the interference occurring from incoming broadcasts on the adjacent frequencies. Unfortunately, this has one major caveat – relying on narrow bandwidths lowers the quality of the audio received. A radio with an external antenna lets you adjust the connection for a clear reception whole the built-in antenna lets you listen to major radio stations. If you’ll be out in the wild, an external antenna is preferable to a built-in antenna. And speaking of the radio’s design, choose a lightweight and portable one over bigger and immobile radios. Note that the design of the radio should be durable especially if you’ll be moving around a lot. Most shortwave radios will pick transmissions from 0.5 to 30Hz, but the best radios have a frequency coverage range of between 1.6 and 50Hz. The most common band allocations include the FM bands, AM bands, Amateur radio, Aircraft frequencies, Longwave bands, International commercials, and Coastal stations. Five words: clarity, sensitivity, selectivity, battery-life, frequency range, and ease-of-use. These things should be on top of your list when searching for the best shortwave radio. Without these, it won’t matter if yours is the most expensive radio or not. You need a radio worth your money, that radio has all the above features.